Six years in the planning, but finally the great day has arrived! “Dinosaurs of China – Ground Shakers to Feathered Flyers” opens today, a once in a lifetime opportunity to get up close to some of the most remarkable, amazing and significant dinosaur fossils ever found. Based in the beautiful Wollaton Hall, (Nottingham), with a complementary exhibit located at the nearby Lakeside Arts Centre, this not-to-be-missed exhibition runs from today until October 29th. Sinraptor dongi – fearsome Chinese Theropod. This cleverly constructed exhibition features a total of twenty-six prehistoric species, plus a wealth of other exhibits and artefacts that tells the story of how one group of dinosaurs – the Maniraptora, evolved into the birds that live alongside us today. There are lots of helpful information panels to help guide visitors and look out for the astonishing artwork that accompanies the fossils created by the famous Chinese palaeoartist Zhao Chuang. Dr Adam Smith (Nottingham Natural History Museum and Exhibition Curator) and his team have skilfully contributed to the informative story-telling aspect of the exhibition by including a selection of fossils and other objects from the Nottingham Natural History Museum’s own collection – no mean feat in itself, as the museum is one of the largest dedicated natural history museums in the UK with over 750,000 items, including some 40,000 fossils. Chris Packham and Dr Adam Smith welcoming visitors at the press day. With a lifelong passion for palaeontology, television presenter Chris Packham commented that he felt like “a kid in a sweet shop”. For Chris, ground shakers such as the huge Mamenchisaurus skeleton, the tallest dinosaur exhibit ever seen in the UK, are simply awesome, but the real jaw-dropping moments are when you can get to see some of the exquisitely preserved fossils of feathered dinosaurs. These remarkable fossils, most of which are more than 100 million-years-old, provide the “smoking gun”, as Chris so elegantly phrased it, linking the birds to the Dinosauria. 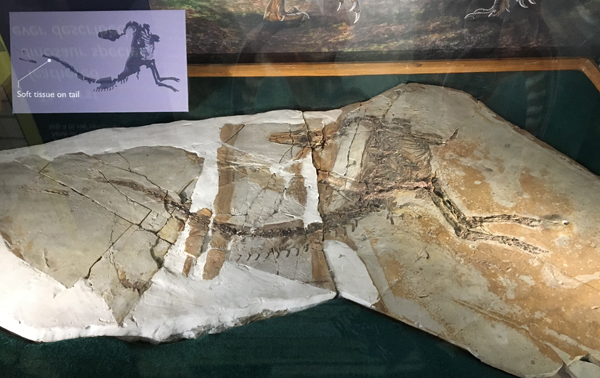 Sinosauropteryx on display – the first feathered dinosaur described. It is a case of “East meets West” with the Dinosaurs of China exhibition. Some 250 different types of dinosaur have been named from Chinese fossils and several important specimens are on display, such as Lufengosaurus, the first dinosaur from China to be scientifically described. One of the key themes of the Dinosaurs of China exhibition is to tell the story of Chinese palaeontology. Thanks to the dedicated efforts of institutions such as the Beijing-based, Institute of Vertebrate Palaeontology and Palaeoanthropology (IVPP), a partner in this Anglo-Chinese joint-venture, visitors will be able to learn how our knowledge of prehistoric animals has been enriched thanks to amazing Chinese fossil discoveries. Lufengosaurus – the first Chinese dinosaur to be scientifically described. Several of the specimens featured are relatives of much better-known dinosaurs from North America. American dinosaurs such as Triceratops may have a bigger profile with the general public than their Asian ancestor Protoceratops, but to a palaeontologist, it is “first horned face” from Mongolia, that is the by far the most significant in terms of the amount of fossil material to study. Protoceratops is the favourite dinosaur amongst Everything Dinosaur team members and it’s great to see it included as part of this most enjoyable exhibition. Protoceratops – the favourite dinosaur amongst Everything Dinosaur team members. Parents of young dinosaur fans will, no doubt, be informed that the majority of dinosaurs found on the ground floor date from the Jurassic. In contrast, the exhibits found on the first floor feature Cretaceous prehistoric animals. The displays have been carefully laid out so that the visitor is taken on a journey through geological time. There is a transition from the Jurassic through to the Cretaceous, this helps to reinforce the idea that dinosaurs evolved into a myriad of different forms. Check out the amazing Microraptor specimen and visitors will learn that this four-winged reptile was not the only flying dinosaur. Take for example, the most recently described animal in the exhibition, the bizarre Yi qi (pronounced ee-chee), which was named just two years ago. The three-dimensional replica on display preserves astonishing detail about this little Theropod. The pigeon-sized Yi qi had downy feathers like a young bird, but wings that resembled those of a bat. It probably was an accomplished glider. The bat-like Theropod Yi qi. To read more about Yi qi a dinosaur with webbed wings like a bat: Yi qi the Dinosaur that thought it was a Bat!